In 2005 we were commissioned by an artist in Florida to create a series of panels to be used as a room divider in her home. She provided us with a line drawing of a tree bending over a river and requested rich color tones of amber and brown. 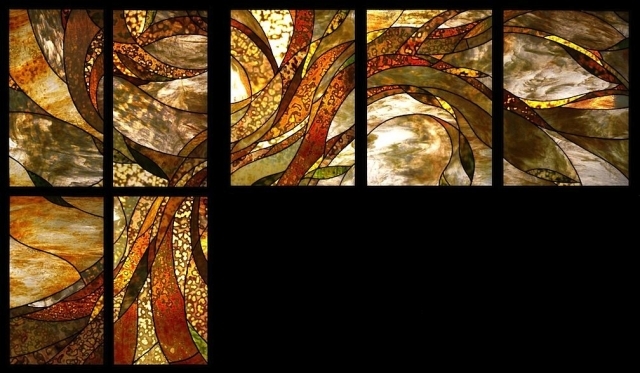 We translated her artwork into a series of stained glass panels. The finished piece was installed with a swinging saloon style door (left four panels) and continued over an existing counter top (right three panels). The windows were held in position with custom metal frameworks. The final installation blocked the view from the kitchen of a space which became the artist’s home studio.